From left to right: Pastor David Tinberg, Louis Mazza, IMPA Secretary-Treasurer, Officer Daniel Dimenna, Joseph Santangelo, IMPA Trustee and James Sassetti, IMPA Vice-President. The Illinois Municipal Police Association Local 1 (Berwyn Police Officer’s Union) in its continuing mission to give back to the Berwyn community, has donated various school supplies to several community organizations to the school supplies can be given to children who may be unable to purchase the required supplies for the upcoming school year. 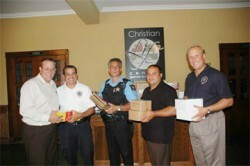 On Wednesday, Aug. 10 several members of the Illinois Municipal Police Association presented Pastor David Tinberg of The Christian Life Center, 3409 S. Grove Ave. The Illinois Municipal Police Association has also donated school supplies to Saint Leonard and Saint Odilio schools of the 98 and 100 school district. “It is the hope, that in part through these donations, all Berwyn school children will return to school with the required school supplies and have a great school year,” said John O’Halloran (IMPA President).